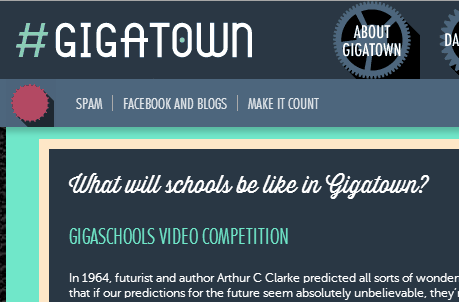 Organised by Chorus, the Gigaschools Video Competition challenges your students to create a video showing what they think learning will be like in the connected schools in Gigatown. There are two age groups – Junior (Years 1 – 8) and Senior (Years 9 – 13) – and some great prizes up for grabs. This looks like a great way to give your students a testing but rewarding challenge that ticks a lot of boxes. Not only is it an authentic activity with real-life goals but also it will require a range of skills, from creativity and planning, to research and technical. The competition is part of Gigatown (www.gigatown.co.nz), a competition being run by Chorus to determine the first town in the southern hemisphere to access a one gigabit per second internet connection. Entries must be made by 5pm on Friday 4 July. But that’s not all. To be eligible, your YouTube video must have received at least 500 views by 5pm on Friday 11 July. We’ve created a Lesson Idea to help you enter. You can download it here or for more information go to the comptition’s website, www.gigatown.co.nz/schools.